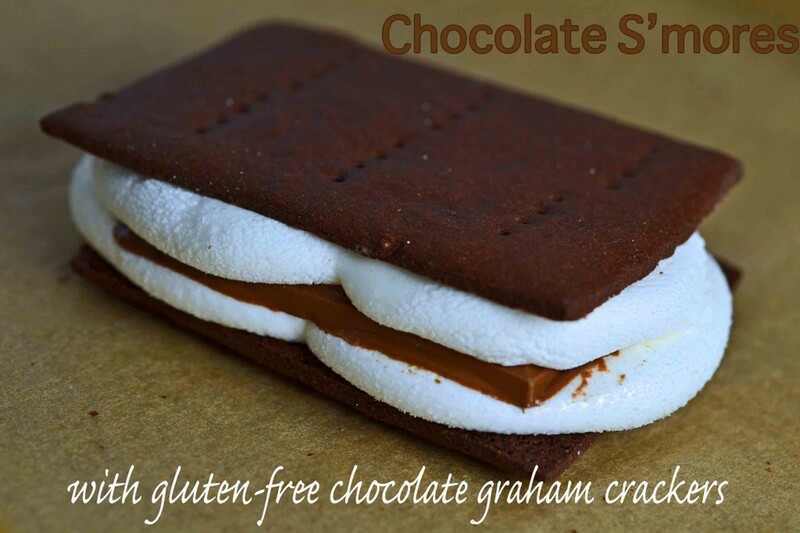 Gluten-free Chocolate Graham Crackers for S'mores | Great gluten free recipes for every occasion. It’s like this. I’ve got one (non-gluten-free) kid in sleepaway camp. She is no doubt eating s’mores. It’s like, The Law. And believe it or not, my celiac son could actually attend this camp. They have a dedicated celiac kitchen. It’s a thing of beauty, and I support them however I can. But, of course, my celiac son doesn’t want to go to sleepaway camp. Any sleepaway camp. He will gladly eat the s’mores though thankyouverymuch. There are, indeed, packaged gluten-free graham crackers. But they taste, well, as you’d expect them to taste. As way way way too many high-priced gluten-free packaged foods taste. Like sawdust. 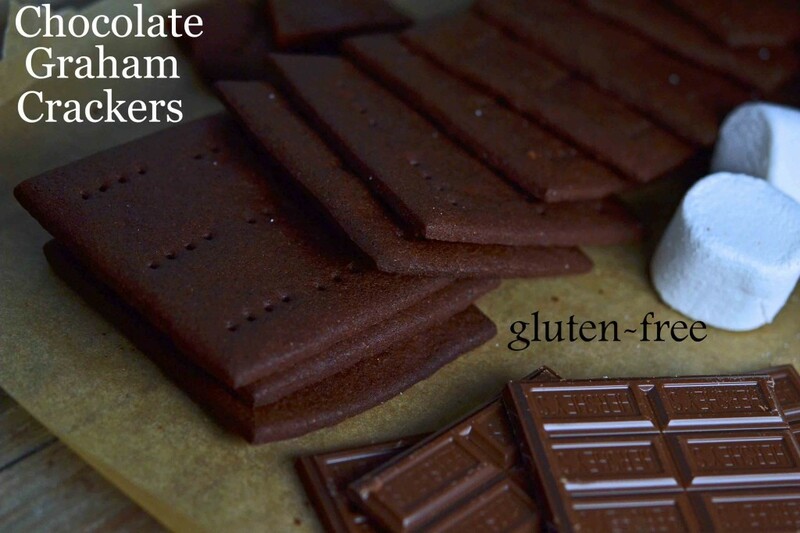 These gluten-free chocolate graham crackers kick those packaged ones right in the pants. They have a deep chocolate flavor, a delightfully crisp texture and they don’t stick in your teeth when you eat them (what is that all about anyway?). And they’re dairy-free! The dough rolls out really easily. Just be mindful not to roll it too thin (no less than 1/4-inch) or they will burn a bit in the oven, and then crumble. The dough should not be refrigerated at all, if you can help it. If you want to bake some of it later, then by all means refrigerate the dough (there’s an egg in it after all), and when you’re getting ready to use it let it sit out until it comes to room temperature. It won’t take too long. In a large bowl, place the flour, cocoa powder, brown sugar, granulated sugar, salt, baking soda and baking powder, and whisk to combine well (working out all the lumps in the brown sugar). Set the bowl aside. In a separate medium-sized bowl, place the shortening, beaten egg, vanilla and the honey, and mix to combine well. Create a well in the center of the dry ingredients, and pour the wet ingredients into the well. Mix until the dough begins to come together. It will be thick and rather stiff. Knead the dough by hand until it is smooth and well-combined. Divide the dough into two pieces, wrap one in plastic wrap and set it aside. Roll out the remaining piece of dough between two sheets of unbleached parchment paper into a rectangle that is 1/4 inch thick (no thinner). Remove the top piece of parchment. Trim the uneven edges of the rectangle with either a pastry wheel or a sharp unserrated knife, and cut into 3-inch by 4-inch rectangles. Dock the rectangles by piercing each about 6 times with the tines of a fork. Gather and reroll the scraps. 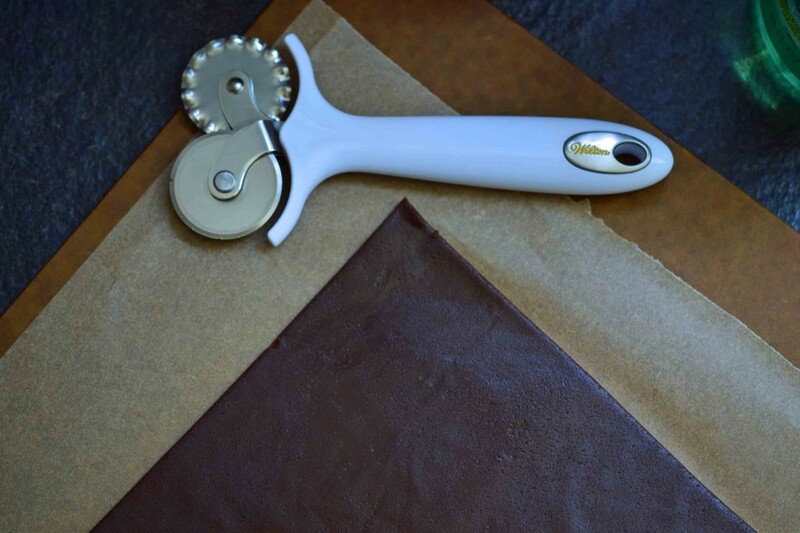 Carefully transfer the rectangles to the prepared baking sheets by gently peeling back the parchment paper. 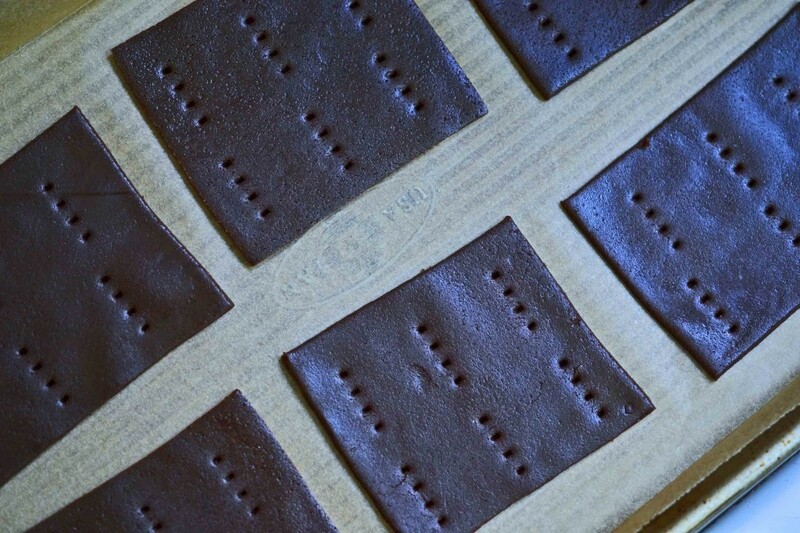 Place the rectangles less than 1 inch apart (they will not spread during baking). Repeat with the second piece of dough. One at a time, place the baking sheets in the center of the preheated oven and baking for 10 minutes or until dry to the touch. Allow them to cool completely on the baking sheets before removing them or they will break. 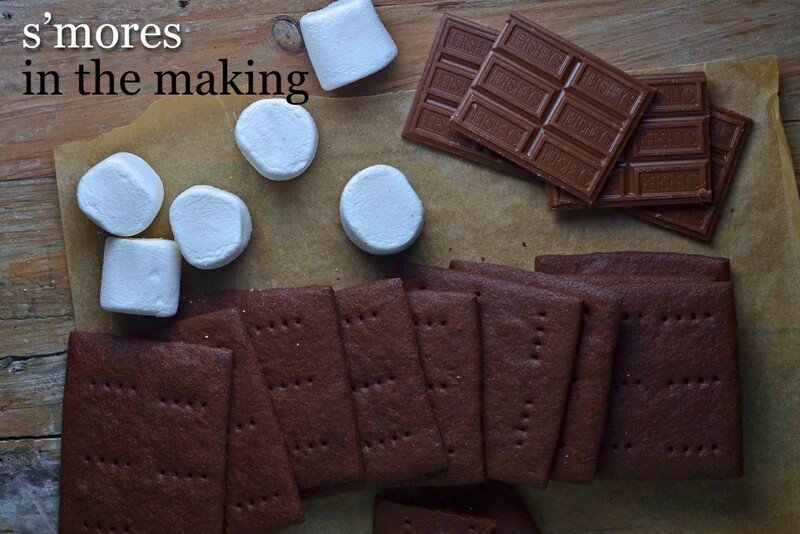 To make s’mores (other than the traditional by-the-fire way), place two graham crackers side by side. Place two large marshmallows on each cracker. Microwave on high for 5 seconds (no more or the marshmallows will explode!). Remove from the microwave, place a piece of chocolate bar on top of one set of marshmallows and close the ‘sandwich’ with the other cracker. Press down. Serve warm. These would taste so good as a crust for cheesecake. I had tried to hack your graham cracker recipe,(from the book), into chocolate grahams. As I can see from your recipe above, my sugar to cocoa ratio was way off and the crackers tasted horrible. Lesson learned, I’ll increased both sugars next time. When you add cocoa powder to recipes, it changes the chemistry a whole lot. Readers very often ask if they can just sub in or sub out cocoa powder, and the answer is a resounding no! love your blog. I have a two year old who is diagnosed celiac and a twenty month old who is not diagnosed, but eats gluten free just because it is easer and the food is great. We have found a great camp locally that caters to celiac kids, but you have to be celiac to go. Where is the summer camp that has a gluten free kitchen? Do you know of any camps like that in the California area? Japanese milk bread without even rolling the dough is my favorite go to bread. Thanks for that. Better batter really makes a longer lasting loaf than cup4cup, but I like the flavor a little better from cup4cup. It is nice to have the variety. I’m really glad the Japanese Milk Bread recipe is useful to you. My daughter’s camp is in Milford, PA, so nowhere near CA, but there are more and more sleepaway camps every year that have a separate, gluten-free kitchen, enough that I would just suggest googling “gluten free sleepaway camps” and you’ll find lots of info. Better Batter has a fair amount more xanthan gum than Cup4Cup, which helps keep the bread fresh longer. One tip is to be you don’t ever ever ever put bread (gluten-free or not) in the refrigerator. It will dry out. If you don’t think you’ll use it all within a couple days, slice it and freeze it in a freezer-safe bag. Defrost either on the counter or in the toaster. Where did you get that cute mini fish cutter? I have found them at Hobby Lobby! Never thought of that! I have the mini fish cutter too!! It sounds like you and your daughter are kindred spirits, then, Dana. Not for nothing, but I had to hunt around for marshmallows a bit, since I could only find this mystery brand nearly everywhere I went. Then I found a house brand at CVS, and it plainly said “gluten free.” Sold!